call Srdja the lawyer to get me out of this hell. 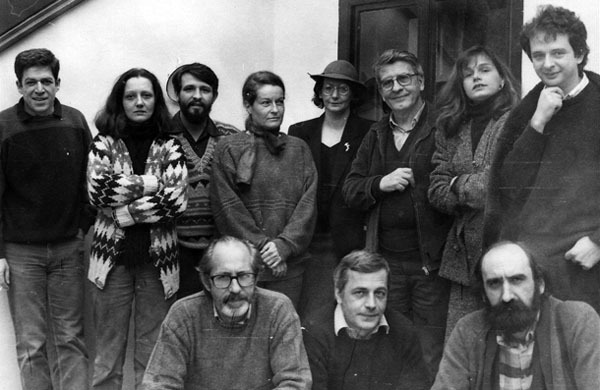 He represented the young Zoran Djindjic, Brigitte Mohnhaupt from Baader-Meinhof Group, Vojislav Seselj, Dusan Makavejev, Milorad Vucelic, Mihajlo Markovic, Mica Popovic, Predrag Cudic, Nebojsa Popov, Vladimir Mijanovic Revolution, Milan Nikolic, Bozidar Jaksic, Mihajlo Mihailov, Momcilo Selic, Dobroslav Paraga, Gojko Djogo, Milan Milisic, Vladimir Seks, Andrija Artukovic, The Belgrade Six, professors forced out from the Faculty of Philosophy. He belonged to the petition movement, and was the initiator of petitions to abolish Article 133 (verbal delict) and the death penalty, to adopt a law on amnesty and to introduce the multiparty system in SFRY. In 1976. he was one of the member-founders of the World Association of Lawyers; 1990. he became President of the Independent Commission for Investigating the Exodus of Serbs from Kosovo; 1990/91. he was the President of the European Movement in Yugoslavia; 1990. he founded the first private media in Yugoslavia, the weekly magazine Vreme; 1993/94. he was a member of the Advisory Board of the Helsinki Committee for Human Rights in New York; 1993. he received the Rule of Law award of the New York section of the American Bar Association. After Milosevic came into power, he immigrated with family to the US and returned to Belgrade in 2001. His last case was the trial for the assassination of prime minister Zoran Djindjic. He is the author of the books: Kosovo Knot – Untie or Cut 1990, Road to Barbarism 2000, The Highest Instance I, II, III 2003, Unfinished Process 2007, Those Bitter Tears Thereafter 2010. Serbian society and war crimes, 29.10.2014. The majority is never right, 01.11.2013. Please, allow me to address you…, 13.02.2013. Notes for a discussion on the end of an epoch, 08.12.2012. Special edition in broken English, 03.08.2012. The moment of truth, 23.05.2012. Drive on, everyone is on board!, 05.05.2012. Criminal complaint for armed insurrection, 17.11.2010. Those bitter tears thereafter, 08.08.2010. The nationalist gene in the Democratic Party, 14.02.2010. Serbia burdened by the Democratic Party, 08.06.2009. The train for Europe, 26.10.2008. How we lie to ourselves, 14.10.2008. The break-up of Yugoslavia – part I, 08.10.2008. The break-up of Yugoslavia – part II, 08.10.2008. What is going on, 17.09.2008. False dilemmas about a ‘false state’, 26.07.2008. You asked for it, 24.07.2008. What happened on October 5th, 22.07.2008.